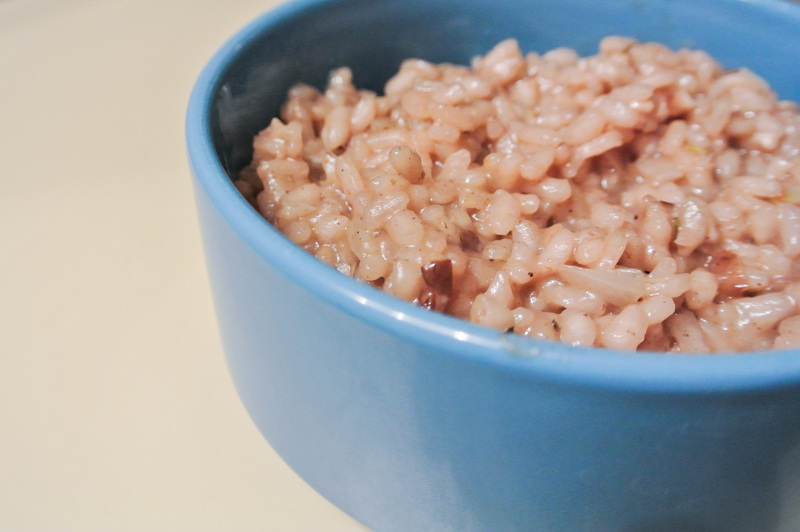 A few months back, I introduced you to my risotto formula, starring Arborio rice and garnet yams. I explained that I like to do risotto up with a vegetable that either needs to be cooked or is generally more palatable cooked, thus allowing me to consume the majority of my other vegetables raw. Today’s risotto features shitake mushrooms. These fungi don’t need to be cooked and I actually really happen to enjoy them raw atop salads, but their richness (and meatiness) is certainly more prevalent in a cooked state. Thus, Travis and I typically make our risotto with some sort of potato, mushroom, or both (but of course, you could use any vegetable or none at all). 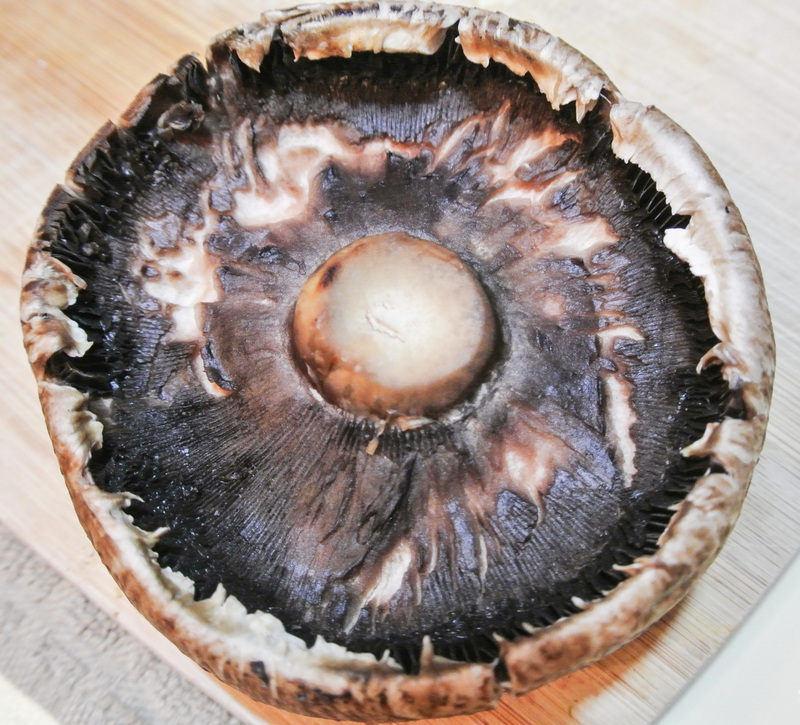 Shitake mushrooms have been shown to strengthen the immune system and lower blood cholesterol levels. They are also powerhouses of selenium, iron, fiber, protein, and vitamin C. They have been used in China for medicinal purposes for thousands of years, so I’m confident that eating a bunch of ‘em will only serve me well. Since I’ve already walked you through how to make risotto, I kept the pictures few and simple for this post. Make sure you check out my previous post if you’d like to see step-by-step visuals for making this decadent dish. Enjoy! 1 cup chopped vegetables (optional) –> I’m using shitake mushrooms. ½ cup white wine –> I’m using moscato. 1 small onion –> I’m using white. Several cloves garlic (go with what you like) –> I’m using 3. 2 tbsps oil –> I’m using extra virgin olive. Fresh herbs, spices, salt, and pepper to taste –> I’m using 1 tsp dried thyme, a few turns of fresh ground black pepper, and a ½ tsp pink Himalayan sea salt. *You may not use it all, but it’ll be close. Have it handy on your stovetop in a pot on low heat, ladle-ready. **Unlike other grains, do not rinse your Arborio rice before use. Start by chopping your onion and garlic and sauté in a touch of oil over medium-high heat until they are almost cooked through, but not quite. Then, transfer them to a bowl, return the pan to the stovetop, add a touch more oil, and sauté your vegetables, if using, until almost cooked. Transfer them to a separate bowl and return the pan to the stovetop, this time over medium heat. Add more oil (about 1 tbsp) to the pan to toast your dry rice. Stir the rice constantly to prevent sticking, toasting it until it has deepened in color slightly, about 5 minutes. 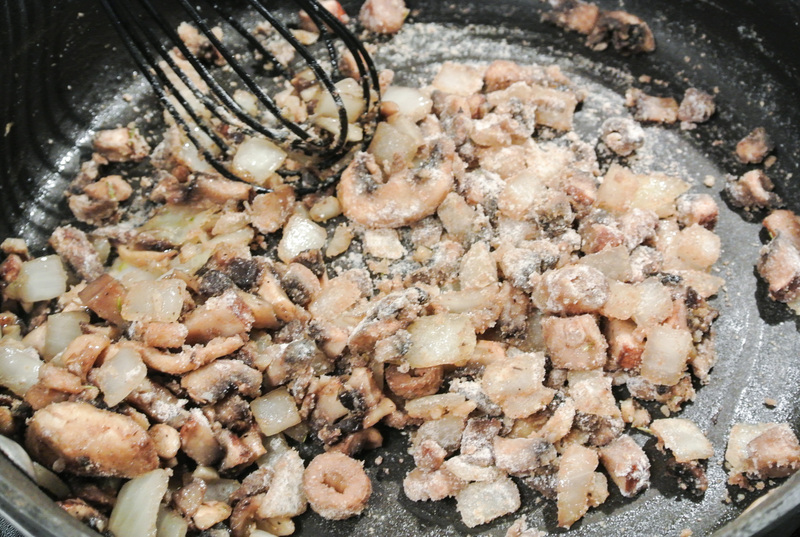 Add in half of the cooked onions and garlic, as well as your seasoning of choice, and deglaze your pan with the white wine. After the wine cooks down, add a ladle of your veggie stock and stir fairly regularly over the course of the time it takes for that ladle to absorb completely. You can expect 3-5 minutes between ladles. You will repeat this process—ladle and stir—many times over the course of 40-45 minutes. When the rice is almost finished, add in the remaining onion and garlic, as well as your veggies (if any), to the pan to finish cooking. From start to finish, this dish will take you 60-75 minutes (depending on how fast you prep and such) and a lot of attention. As soon as the rice is tender, you’re done, so taste as you go. Garnish with fresh herbs or thinly-sliced green onion. Makes for yummy, comforting leftovers for 3-5 days. Savory Mushroom Gravy, Courtesy of Travis! For today’s post, my amazing hubby Travis is making a guest appearance. Nearly thirty weeks pregnant, these days, he’s doing more work in the kitchen than I am. Thankfully, he loves to cook and doesn’t view it as a chore. In fact, in the two years that he was working on his MBA, he really missed honing his culinary skills. …not that they need much improvement! Travis is an excellent amateur chef and has even competed in the past. Like me, he will peruse a few ideas online for inspiration in creating something new and then just go for it. Every time someone tastes one of his dishes and asks for the recipe, he is at a loss because he never measures or writes anything down. His genius comes to fruition through randomly throwing items together. For today’s savory mushroom gravy, I asked Travis to develop a versatile formula and this time, to record it. 🙂 He did not disappoint and highly recommends listening to Norah Jones during preparation. 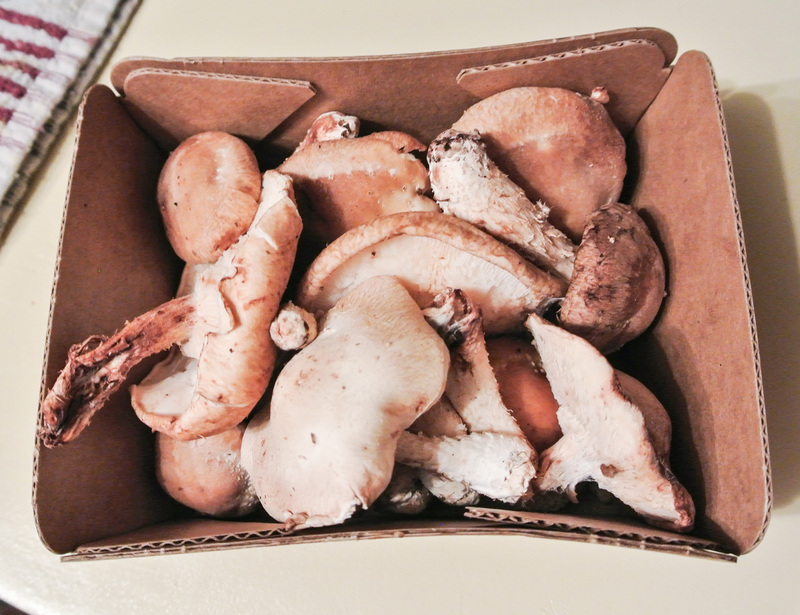 Before we get to cooking, a quick note about one of the star ingredients: button mushrooms. 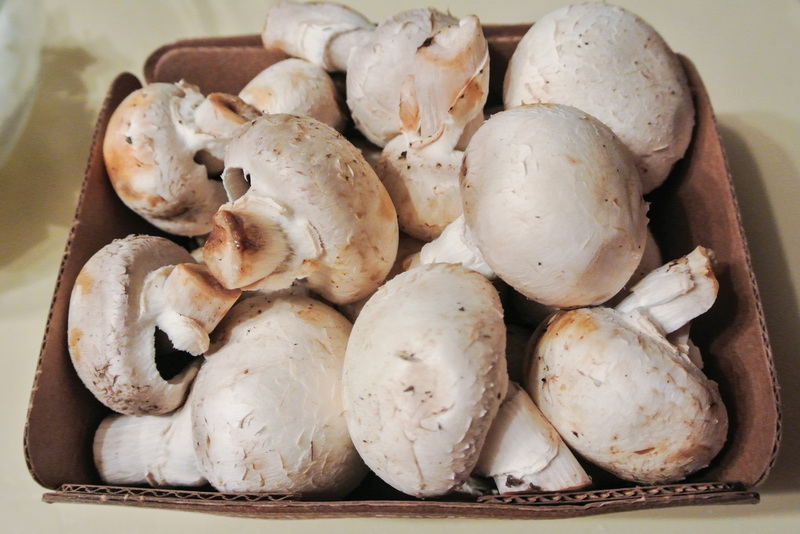 The most commonly consumed mushroom, available year-round, is the white button. Although not as aesthetically appealing as fancier, more exotic varieties, these fungi get the job done. Like many (if not all) mushrooms, buttons develop a meaty texture when cooked and are rich in copper and essential vitamins. Several studies have even show buttons to prevent heart disease, boost the immune system, and treat and prevent some types of cancer. Win! Portobello mushrooms are also featured in today’s adaption of Travis’s gravy formula. You can read more about this in my lettuce wraps post, another delicious way to consume fungus. One more thing…if you like a chunky gravy, finely chop your ingredients. If you plan to puree the ingredients for a smooth, creamy gravy (which is what we’re doing today), a coarser chop is sufficient so long as the pieces are approximately the same in size for even cooking. Enjoy! 2 cups chopped mushrooms* –> Trav’s using 1 cup each white button mushrooms and portobellos. ¾ of an onion, chopped –> Trav’s using white. 2 tbsps flour –> Trav’s using whole wheat. 1 tbsp oil –> Trav’s using extra virgin olive. ½ tsp minced fresh herbs (or ¼ tsp dried) –> Trav’s using ¼ tsp dried thyme. Salt and pepper to taste –> Trav’s using a pinch of pink Himalayan sea salt and several turns of freshly grated black pepper. *If you’re using any large caps with lots of gills, remove the gills before chopping and cooking. Pour your oil in a sauté pan over medium heat. Chop your vegetables. Start by adding the onions only. After approximately 2 minutes, add the garlic. 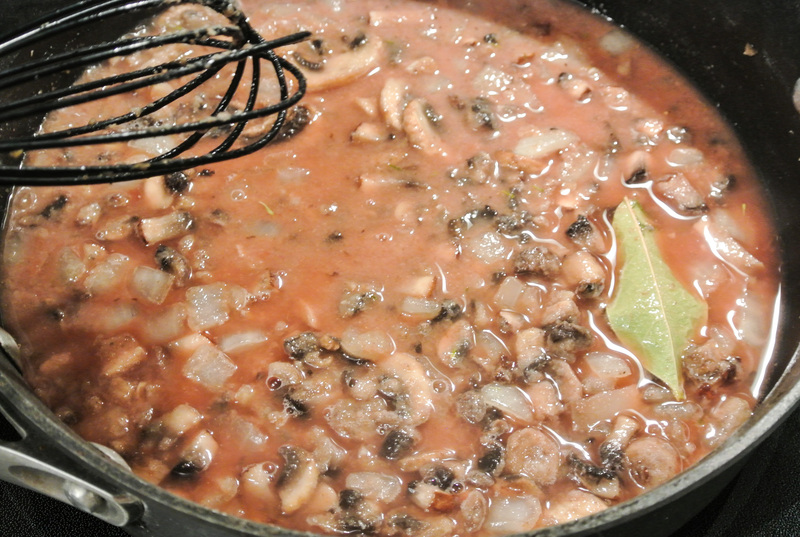 2 minutes later, add the mushrooms, herbs, and bay leaf and cook for another 6-8. Add the flour and stir until thoroughly moistened. Add cooking liquid, a ½ cup at a time and reduce until desired consistency is achieved. Add salt and pepper to taste and remove the bay leaf. 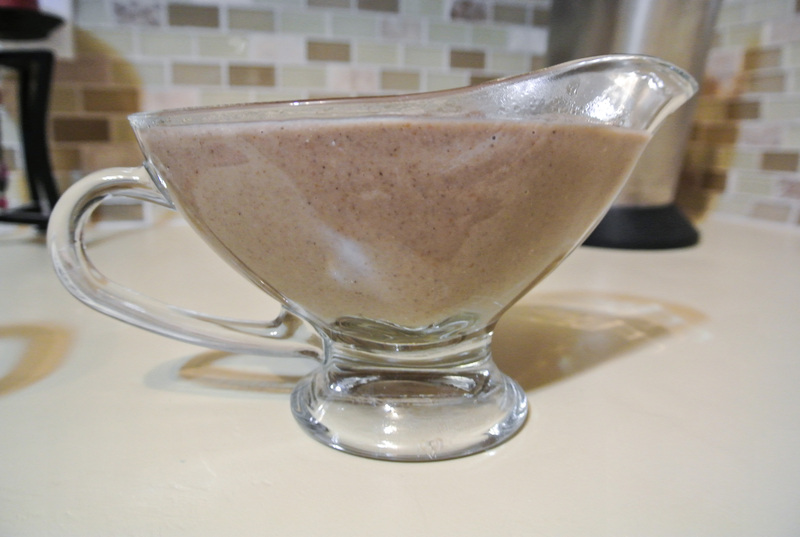 Pour the entire mixture into a blender and puree until smooth (optional). Serve atop classic mashed potatoes, in a vegan shepherd’s pie, or in another favorite preparation. We are serving ours over rosemary mashed sweet potatoes and parsnips: the perfect balance between sweet and savory! 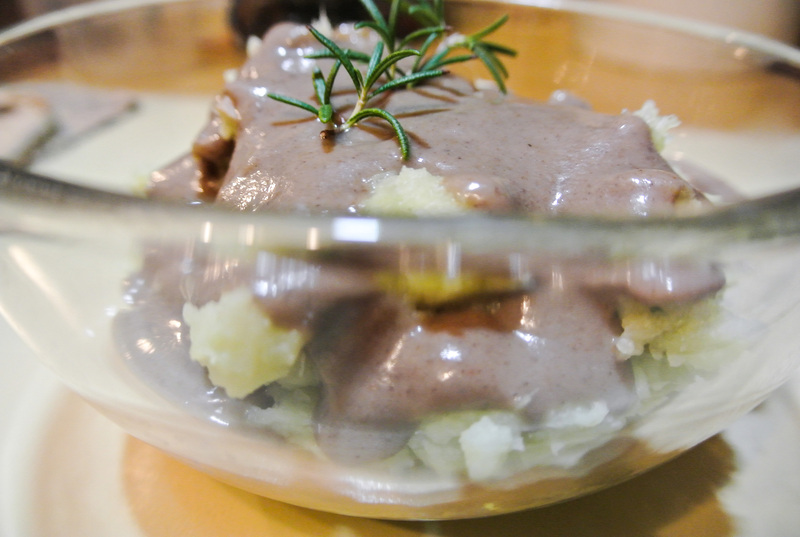 Travis reported that this gravy tasted best the first day, but can certainly keep for several in the fridge.